Newport Bay Club is an exclusive country club community known for its prestigious location and perfectly-landscaped surroundings. This gated community offers the best of country club living, and it uniquely does so without any equity fees or mandatory membership. As soon as you pass the guard gate, the tranquil tree-lined streets in Newport Bay Club lead you into a tropical oasis of four distinct subdivisions. In addition to the well-appointed, spacious interior living spaces, each of the homes within the community offers views of the surrounding lakes and lush tropical landscape, providing for a truly beautiful, panoramic view of the hidden paradise that is Newport Bay Club. Amenities-wise, Newport Bay Club does not disappoint. Residents enjoy a 7,500 square foot clubhouse that consists of an Olympic sized swimming pool and a state of the art fitness center with newly-refurbished equipment, as well as racquetball courts, basketball courts, and a popular children's playground. The community also has a high-quality tennis program, offering 8 Har-Tru clay lighted tennis courts, a tennis pro shop, and a year-round calendar of tennis events and leagues created by the USTA tennis staff. 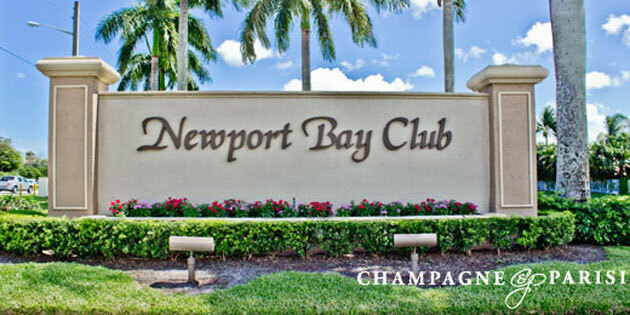 If you would like to learn more about the luxury homes for sale in Newport Bay Club or would like to request more information about other Boca Raton country club communities, please give us a call at 561-998-9015. You may also reach us by completing the brief online contact form provided directly below, and one of our country club real estate experts will reach out to assist you. We at Champagne & Parisi Real Estate look forward to having the opportunity to assist you with all of your Boca Raton real estate needs.